The original painting is displayed in the Old Temple of the Vedanta Society of No. Calif showing Christ as a yogi. The original painting is displayed in the Old Temple of the Vedanta Society of No. Calif. The story goes that Sw. Trigunatita had a dream or vision of Jesus Christ and asked one of his disciples to paint it according to the scene he remembered. The result is a classic painting of value not only to those who see a synthesis of spirit with Christ and the East, but to the Christian community as a whole. Please note that the photograph on the web site is nowhere near the quality of the actual photograph. 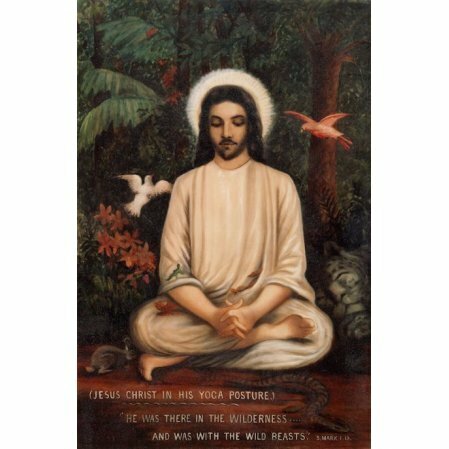 The Christ the Yogi print is our most popular photo. Note the new option for an oval photograph.